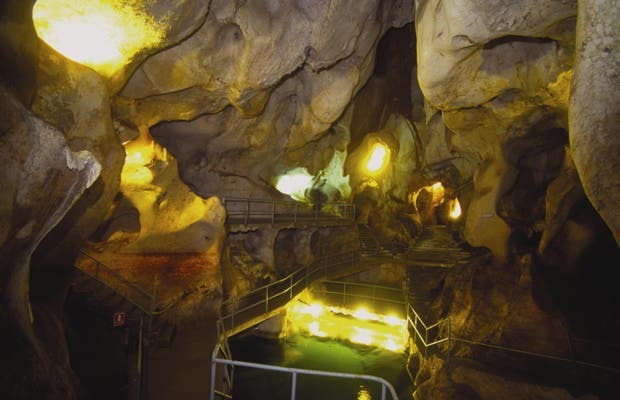 I knew about this cave from the Canal Sur progam "La Banda". It's amazing that it doesn't get more publicity as it is one of three marine caves in the world and the only one that you can visit (visits are guided and last approximately 35 minutes). Its has a linear route with has two galleries. The one on the right goes to the mountain, has more fresh water leaks and some small lakes. The left leads to some galleries and a curious worship hall to an Egyptian goddess. The silence in the cave is overwhelming, especially when the visit is uncrowded. A myth about hidden treasure and someone seeking it dying during an explosion endows the cave with an air of mystery. This is one of only three caves of marine origin in the world. It is unique in Europe and has Neolithic cave paintings, pottery and lithic objects. Legend has it that there is hidden treasure inside that, despite search expeditions, has not yet been found.